What did the same analysis reveal over the past year? Are you simply growing at 8%? Yes, I think this needs to be addressed since there’s even a linear trendline on the graph, suggesting gradual growth. Plus, the average user is college-aged. Does the behaviour of prospective users change over the holidays, resulting in a natural increase or decrease in sign-ups? This would be easily solved with some A/B testing. In any case, if we armchair critics are wrong, congrats on the improvement! 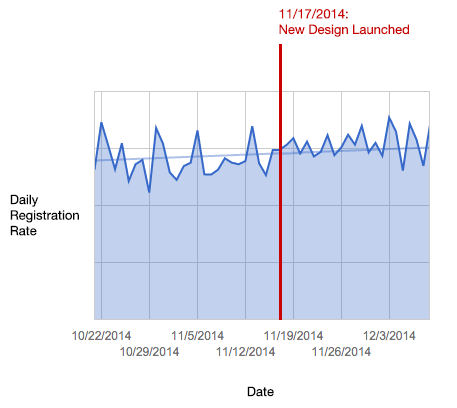 Similar to Foo bar, the trend on that graph appears to be increasing before the new sign-up for was released. Make sure you compare year-on-year to get more accurate growth stats. I sure hope going from an extremely poorly designed form to one designed with even an ounce of sanity would result in an increased conversion. The registration dialog is completely unusable on mobile devices because you continously center the dialog (off the top left of the screen) as a user zooms and pans. Make the dialog do positioning on display only (not on window resize), prevent it being positioned past 0,0 and and you’ll see another boost. I’m having a hard time reconciling this plot with the text. You state that the site changed resulted in a 8% increase in sign ups. However, prior to 11/17, I see a time series with a mean of perhaps 7.25%, followed by a time series that looks identical, perhaps a tiny bit higher averaging perhaps 7.5% That’s neither 8% relative or absolute change. The plot appears to show either minor or no change. Where did I go wrong in understanding it? Removed the captcha, more fraudulent signups? Also a comparison to previews periods would be good, if not it’s just smoke. I wonder if removing the captcha code skewed the results. Is there a way to measure bot created accounts? I’m sure the change has raised conversion but maybe not to that extent.